Drive past the strip mall at 157th and Pacific in Omaha on a Friday or Saturday night and you’re sure to see the parking lot full of cars. Two big names in Omaha dining have set up shop in west Omaha. One being a fine Mexican restaurant named Hector’s and the other being Mama’s Pizza. 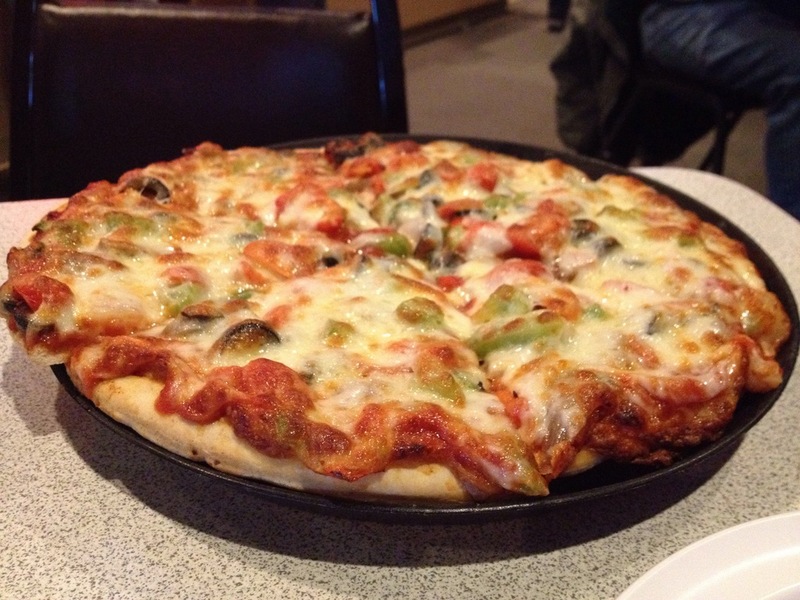 Mama’s Pizza is a family owned business that started more than 25 years ago at their original location on Saddle Creek Road. They now operate two restaurants, the original and the west location in Millard. We arrived about 5pm on a Saturday night and the place was nearly packed already. The west location is a pretty big place with a lot of seating, but on this night a large number of tables were reserved which made for some tight dining and some frustrated customers. More on that later. At Mama’s, you place and pay for your order at the front counter then slide to the right to gather your drinks, plates, silverware, napkins, condiments, etc. The menu is on boards above and behind the counter. Tonight we ordered onion rings, a veggie pizza and a pepperoni and Italian sausage pizza. We were issued a number and then took one of the last three tables left. Unfortunately for us, the remaining tables that weren’t reserved were located right near the counter and the long line that was forming. There are few things worse than staring at the backsides of strangers while at the same time being on display to a bunch of hungry and frustrated people. In addition, the row of tables that is closest to the counter is just too close to the counter. Many times people passing between the line at the counter and our table would have to skinny up and move a chair just to get past, making an uncomfortable location even more so. The upside to being so close the the line was being able to hear people complain about not having anyplace to sit. We heard more than one group decide to try another place to eat. To their credit, the staff at Mama’s did free up a few of the reserved tables to accommodate the guests that did decide to stay. That of course could mean that if you reserved a table, it might be filled when you got there. A place this busy needs to have a waiting area for patrons to hang until tables open up to ensure they have a place to sit after ordering their pizza. Our onion rings were served quicker than it took me to write the last paragraph. Our number was called over the PA system and up to the counter I went. There were a ton of rings. We could and should have just gone with a half order for the two of us. They were warm but not hot, so they might have been kept at the ready as opposed to being dropped when an order comes in. I could be wrong about this (1. see UPDATE below). I’ll now use what we decided was our word of the night: average. While the onion rings were plentiful, they weren’t a standout in any way. We’ve been lucky enough to eat the best onion rings in the world at a place called Kalypso Island Bar & Grill (formerly called Zelo’s) on the north shore in Hanalei on the island of Kauai, so we are a bit spoiled. Mama’s rings were just average. After eating too many onion rings, our number was once again called as our pies were ready. A quick trip to the counter produced some pretty good looking pizza. There really isn’t much to say about the sauce here either. It was used sparingly and didn’t have much of an impact on the pizza either way. Average. The veggie pizza was LOADED with vegetables and cheese. Yes, the mushrooms were canned, but the diced tomatoes, onion, and green pepper were plentiful. Another reason to shout “Hooray”? The sparing use of black olives. Some places use a heavy hand when adding the olives and Mama’s did not, much to the Pizza Wife’s delight. The pepperoni and sausage pizza was pretty good. It’s loaded with plenty of toppings and piled high with cheese. All of the toppings are under the heaping layer of cheese. The sausage is in the form of little marble sized pellets. Obviously something that is delivered, probably pre-cooked and frozen. The pepperoni was pepperoni and it was good. All in all, an average pizza. We were expecting pretty high marks for Mama’s given the fact that they’ve been in business for so long, now have two locations, and the west location always seems to be absolutely packed, especially on the weekend. 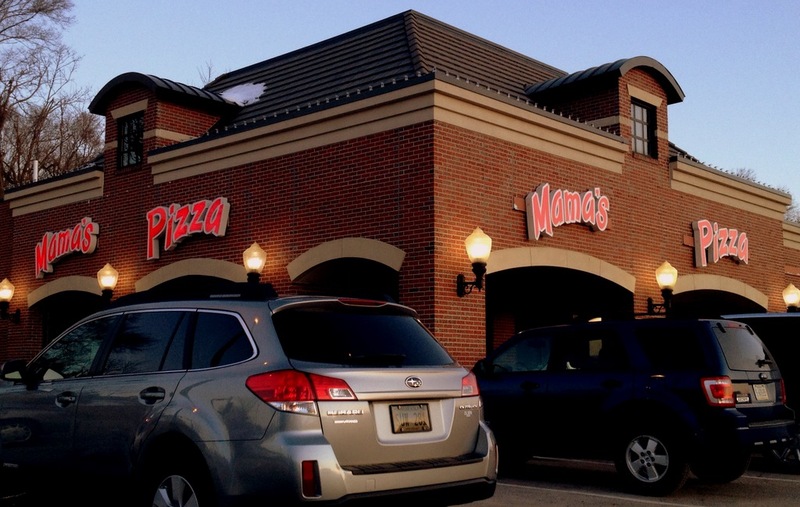 Apparently we may be in the minority with our opinion of just an average pizza place, as long lines and a full house clearly indicate that those in West Omaha really love them some Mama’s Pizza! We didn’t feel the quality of the pizza and onion rings justified the long lines. 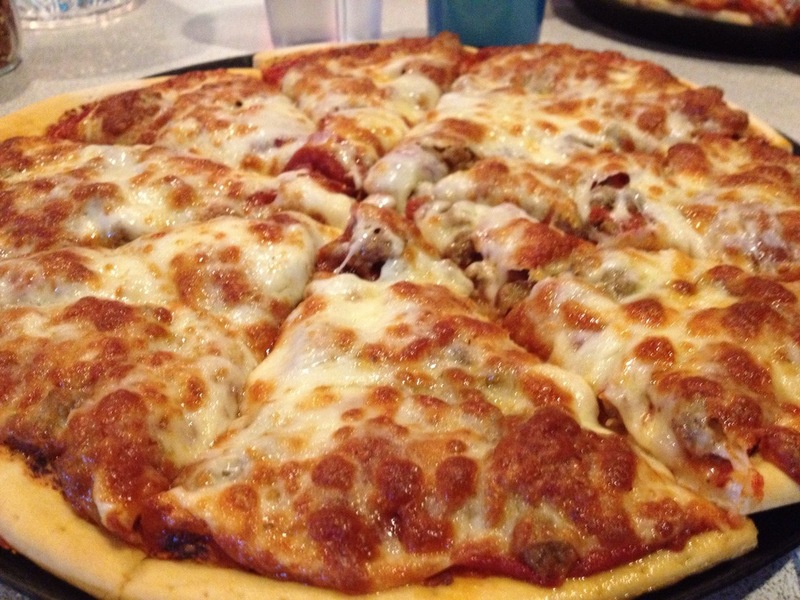 How would you rate Mama’s Pizza? Click on the stars below! 1. And we were wrong on this. Recently, a Mama’s pizza representative commented that each and every order is prepared when ordered to ensure quality and freshness. 2. We were indeed correct about the ovens Mama’s uses to prepare their pizza. The same company representative confirmed that they now use conveyor ovens in both of their restaurants. The Roto-Flex ovens, while good ovens, were not able to keep up with the ever-increasing demand of their quality pizza. This entry was posted in Pizza and tagged Mama's Pizza. Bookmark the permalink. Perhaps we just disagree on our favorite type of pizza? I have had inconsistent pizza from Mama’s. I noticed your updates. On one of my visits, I had the same “warm” onion rings as you did, Did not seem made-to-order. And the pizza was not what I had recalled from the Saddlcreek location. My last visit was a carryout, and I did see the conveyor oven. I typically eat at the saddle creek location for lunch, and they are always packed. I know at least 2 of my visits they have lost or misplaced my order (always with the same other 2 people who receive great delivery) I have eaten at the West location twice, and I haven’t been as impressed- just not the same as the original location. But the pizza at the Saddle creek location has always been AMAZING! We ate at Mama’s after doing some research and seeing all the rave reviews and were less than impressed. The pizza was mediochre and the onion rings (which have received rave reviews) were barely warm. We should have dived right in when we retrieved them instead of letting them “cool down” a couple minutes! Guess that’s why there are so many pizza joints serving so many different types of pizza – to each their own! Mama’s is good, but the only standout feature of their pies is the massive amount of cheese. It reminds me of a better version of Casey’s pizza which isn’t really a compliment. the chewiest cheapest tasting ground beef ever! Wayyy overrated & pricey too.If u go there<bring plenty of flossers as u will be picking at your teeth all night-no thanks!